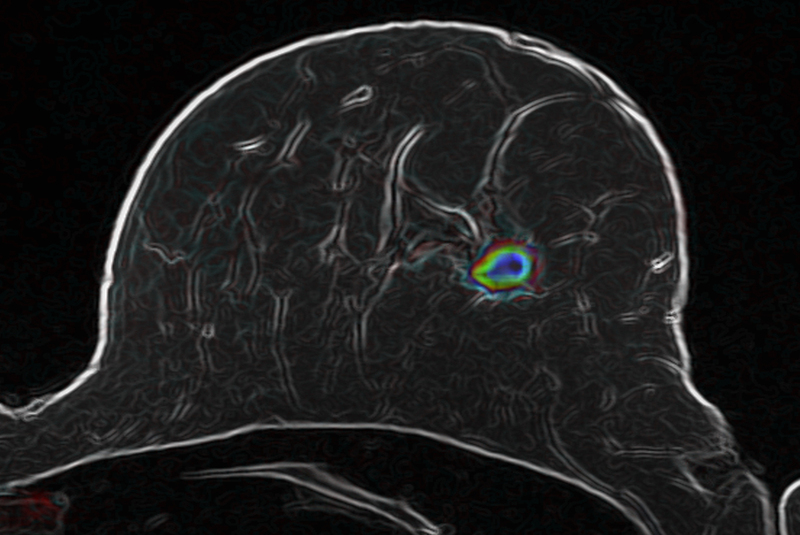 Bickelhaupt and his colleagues have therefore optimized a method called diffusion-weighted MR imaging (MRI) for examining the female breast and combined it with intelligent computer-based image analysis methods. Diffusion-weighted MRI is a special technique that makes it possible to see the movement of water molecules in tissues and to observe it using a computer algorithm. Malignant tumors change the structure of tissues, thus causing changes in the movement patterns of water molecules. This link might be utilized in the early detection of breast cancer – without the necessity to take tissue samples or use contrast agents in the body. “Our goal is to obtain better noninvasive insight into the interior of the body and thus provide additional information about tissues for clinical evaluation by radiologists, along with the standard methods, which will continue to be relevant,” said Bickelhaupt. “We use our own specially developed intelligent software to evaluate the images,” said Paul Jäger, a computer scientist who shares the initial authorship of the study with Bickelhaupt. “This makes the method largely independent of interpretation by individual physicians.” In this way, constant reliability of the method can be assured at different study centers. In a next step, the method must prove its worth in larger multicenter studies before it can be used as a routine method in the clinic. The scientists are currently building the collaborations that are needed for these larger studies. “If our result is confirmed in future studies, we will have an additional diagnostic tool available that will enable us to further enhance the early detection of breast cancer,” Bickelhaupt said about the promise that the new method holds. Use is free of charge. The German Cancer Research Center (Deutsches Krebsforschungszentrum, DKFZ) permits one-time use in the context of reporting about the topic covered in the press release. Images have to be cited as follows: “Source: Bickelhaupt//DKFZ”.